If a vehicle is determined to be a lemon under the California Lemon Law, the vehicle’s buyer is entitled to restitution. Restitution is another term for buy back. In a Lemon Law buyback the buyer is entitled to reimbursement of the following including, but not limited to – vehicle cash price, sales tax, license, registration, official fees, finance charges, etc. The buyer is also entitled to incidental and consequential damages such as rental car and towing costs. The buyer is not entitled to be reimbursed the costs of aftermarket items such as window tint, aftermarket rims, aftermarket alarms, etc. The manufacturer is entitled to an offset for mileage the buyer put on the vehicle prior to delivering it the first time for repair of the problem leading to the buyback. The formula for the mileage offset is – mileage x vehicle price/120,000. For example, if the mileage figure is 6,520 miles and the price of the vehicle is $28,435.62 the formula is – 6,520 x 28,435.62/120,000 or $1,545.00. 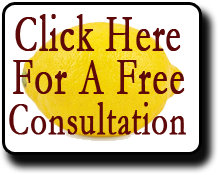 If you think you may have a lemon vehicle, feel free to contact us and we will be happy to provide you with a free consultation.